The weekend of September 21-22nd the weather was picture perfect in central Illinois and the festival gods shined down on the Macoupin County Historical Society’s fall festival. Visitors flocked to town to check out the impressive display of vendors, the Anderson mansion, a bit of Blue Grass and of course the food and the tractors! 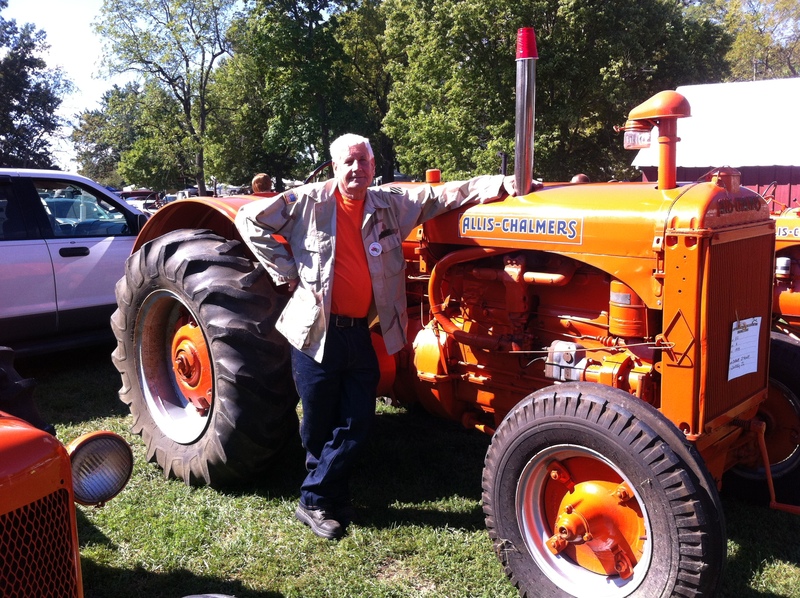 Allis Chalmers collectors like Duane Stone in the picture with his 1957 Allis Chalmers A enjoyed the event. AC was the featured brand and there was a nice variety of tractors including some unusual combines. My husband got his fix at Jim Ballanger’s tool booth and I couldn’t resist a T-shirt, cape and mask combination for my grandson. We tried dinner with our friend Kent Elliott at Reno’s in downtown Carlinville and made a day of it! While the fall festival has run its course, there is still the Christmas celebration! Log onto http://www.macsociety.org/ for more information!